I decided to make a video post today. It will sum it up a lot faster if I show you then just write it down for you. However, if you can’t load the video for whatever reason, below are the highlights! It HAS to taste good…otherwise, it’s going to sit there and we’ll all dread drinking the thing. Stevia is the sweetener of choice – preferably organic. Try different flavors of the same brand – it makes a difference. Don’t worry if you like one and your family likes another – only buy it if you like it. I don’t drink it every day, but when I do, it’s usually AFTER a lifting workout only. Get your protein from foods first if possible. Do what works for you. Don’t be pressured to buy a multi-level marketing protein mix. If you do the research, generally they promise great protein and it’s not much more than the stuff you buy at Sam’s (they ALL are not like this – so do your homework and don’t just trust the words of someone selling it). Make sure you get enough throughout the day. You can get sluggish with your metabolism if you aren’t getting enough, amoung other issues. When we are hungry and don’t know what to eat – protein should be the first thing we run to. So how much is too much and how little is too little? God created every person differently, thus we have various desires, strengths, and weaknesses. This also means we have different metabolic needs – a different number of certain foods for each of us. If I’m a runner, and not a heavy weight lifter, I won’t need as much protein, however, I still need it, nor does a child need as much protein an adult, etc. The point is to make sure you are getting enough. The average person should consume about half their body weight in grams of protein. A person who weighs 200 pounds, should consume around 100g of protein. If you are unsure of your protein needs, seek out a health care professional. There are tons of them at your fingertips in your community, and they don’t bite. Seeing a Dietician or Nutrition Specialist could truly help you find your personal needs in protein, carbs, and fat metabolic distributions. It could change your daily living to a more positive life experience if you have issues with them. 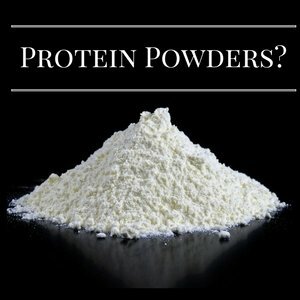 If you ask a professional athlete what protein powder they use, it will likely be more expensive. Do you get what you pay for? In some cases, yes. I like to be able to support local businesses, good businesses, Christian Businesses, and sometimes physically go to the store to get my protein. But that’s me. Maybe you don’t have the time or you have the money to go buy what the NFL players consume. Either way, do what works best for you and your family. ⟵Core Balance Workout – No Crunches!